Restoring or finishing a wood floor represents a big investment. Whether it is in a gymnasium, a store or a residence, it is important to properly protect your floor to maximize its durability and enjoy it longer. 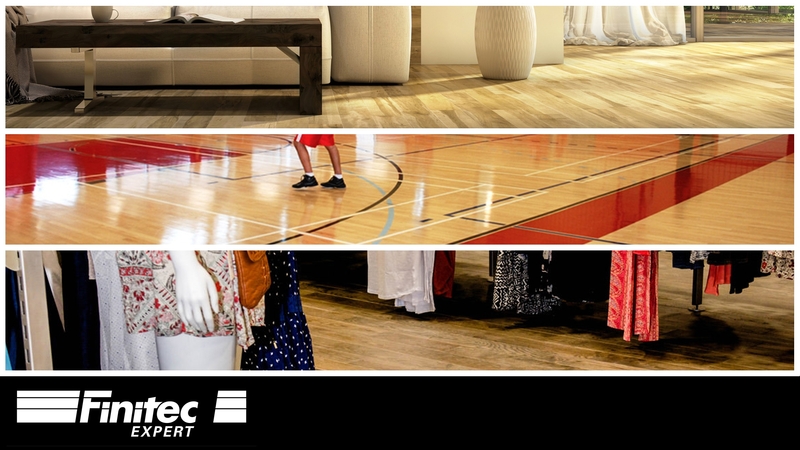 Finitec Expert's SURFACE care is specially designed to professionally clean commercial and sports flooring. Efficient and ecological, it leaves no residue or streak on the surface you are working on. Sold in 18,9 liters containers, this waterborne concentrated cleaner has to be diluted (1:10 ratio) before using it. This product, easy to use, that requires no rinsing, has no artificial coloring or aromatic solvent removes shoe mark and dirt from the surface. Safe and non-slippery, it ensures the user's safety. NOTE: It is important not to use the Finitec's SURFACE care on an oiled or waxed floor or on a bare wood surface. Restoring a residence's wooden floor is a big investment for consumers. That's why the Finitec cleanersare also available in user-friendly containers that are adapted to their needs. These cleaners have the same benefits and characteristics than the Finitec Expert’s commercial and sports flooring cleaner. With frosty flowers, wild mint, frosty lemon, and floral breeze scents, the only thing remaining on the floors after the usage of this product will be a fresh smell and more importantly, cleanliness that will not alter the floor’s shine. Not all the cleaning products are made to be used on wooden floors. All-purpose cleaners are to be avoided. They contain detergents, surfacers, alkaline and caustic agents that may alter the floor's luster. Oppositely to the Finitec's cleaners, these cleaners leave residues that wrap up dirt on the floor. Water is not a product recommended for wooden floors either. An excessive water quantity can cause a water infiltration between the wooden slats and a premature surface deterioration. For a long time, vinegar has been recommended to clean wood floors. However, nowadays, it is not the case. This product's acidity prematurely alters the floor's finish. Its restoration must, therefore, be done more often. The oily and greasy film that builds up because the oil soap cleaners and waxes cause several maintenance problems. The floors will be sticky and hard to restore. That's the reason why these products shouldn’t be used on wood floors. All other hydroxides, bleach or ammonia-based products such as perfumes, deodorizer or window washer should be avoided since they are not adapted for wood floors. A wooden floor regularly has to be maintained and cleaned if its luster and quality want to be kept for a long time. Whether it is a commercial, residential or sports surface, the maintenance that has to be done on it is the same. It is therefore important to advise and use products that are adapted to the floor's needs.